It is hard to believe that Carrie was actually written 40 years ago as it is a story as relevant today as it was when first published. I'm going to go on the assumption that most everyone has either read the book or seen a movie version of it and not worry about spoilers. There may be a few to come but I'll try to avoid them...read on at your own peril. I used to be a huge fan of Stephen King and greedily devoured his stories as quickly as they became available but then his stories changed, he became very long winded, and his books boring rather than thrilling so I turned to other writers. This is a re-read for me and I chose it to see if I could recapture some of my earlier love for his writing. What happened in Chamberlain High School can be seen in Columbine and other schools over the past few years. An abused and mentally fragile teen finally reaches a breaking point, a point where she can no longer accept the jeers, taunts and bullying from the so-called "cool kids" and strikes back when the one glimmer of happiness is so cruelly wrenched from her, when she realizes she will always be the misfit subject to ridicule. She is a teen who suffers abuse by her hyper religious mother who sees sin at every turn to the point, that anything fun, any laughter, or anything that makes life a little happier or easier is the devil's work and must be prayed about and routed out. Any infraction of the rules issued by Carrie's mother results in hours spent locked in the "praying closet" with images of Jesus on the cross bleeding from his wounds. So much blood! Your heart has to go out to Carrie who leads an isolated existence devoid of friends or confidants at school or in her neighborhood, a girl whose home life is a nightmare of repression rather than a safe haven of love and acceptance. There was only one likable character in the whole book, Tommy, a boy who was confident enough within himself that he didn't need to follow the cruelty of others to be "popular" but treated others with genuine kindness and respect. I fail to see what he saw in his girlfriend, Sue, who after being shamed by her treatment of Carrie, tries to ease her conscience with a grand but hollow gesture through the use of Tommy. If only she had simply apologized to Carrie and treated her with dignity and a little kindness from the shower incident on into the future, the whole night of terror might have been averted. Sue, IMHO was the worst of all of them. The other cast of characters you can see at every school, the "mean girls", rich, spoiled and totally incapable of empathy, the followers, the "bad boys", the inept teachers, the victims, in other words, a mirror of society in general. 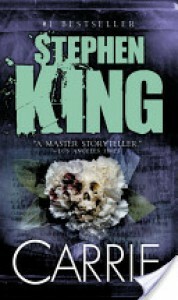 Reading Carrie reminded me of why King was to go on to achieve such success as a writer. Even at the beginning his career he understood human nature and wrote of characters we could believe were real, after all, we have encountered these people throughout our entire lives, that, and he could tell a really good story! Although this book didn't rekindle my love or send shivers up my spine I still think I'll go on and revisit some of his other works as well.